Release of the new Yamaha 3D X-ray Hybrid Inspection System "YSi-X" - News Releases | Yamaha Motor Co., Ltd.
Yamaha Motor Co., Ltd. will release from July 1, 2012 the new automated X-ray and optical inspection system "YSi-X." This is a multi-function 3D X-ray hybrid-type inspection system capable of complete in-line inspection of all facets of printed circuit boards thanks to a 3D X-ray inspection function through newly developed Yamaha-exclusive high-speed X-ray laminography imaging technology and multiple inspection functions utilizing optics and lasers. The YSi-X features 3D inspection algorithms as standard equipment for identifying defects such as insufficient solder joint, un-melted, openings, bridging, XY shifting, θ rotation, insufficient ball size, missing ball, and voids in ball. It also achieves the highest level of 3D inspection speed in the industry at 3.3 sec./FOV (under optimum conditions defined by Yamaha) due to new Yamaha-exclusive X-ray laminography imaging technology. This model also boasts a hybrid design that couples 2D and 3D X-ray inspection functions, optical inspection and laser measurement function for height inspection to enable selection of the optimum measurement method for each part to be inspected, thus providing efficient, high-precision inspection. Because this hybrid capability eliminates the need for a separate optical inspection unit necessary in conventional lines, the new YSi-X also reduces overall investment for an SMT production line. Furthermore, adoption of the latest technologies for the X-ray source and X-ray detector and the use of Yamaha-exclusive control technology has extended the full-operation life of the X ray tubes and the X-ray detector to a long life of four years. This greatly reduces the running cost for the X-ray source and the X-ray detector. Yamaha 3D X-ray Hybrid Inspection System "YSi-X"
Model name Yamaha 3D X-ray Hybrid Inspection System "YSi-X"
As many industries answer the need for products that are more compact, have more functions and higher levels of performance, there has been a rapid increase in the use of underside electrode type components in recent years. Because the solder joints for these parts lie under the component, the solder can't be fully inspected by exterior optical or visual inspection. Also, because electrical circuit tests and function tests can't detect the strength of the solder joint, it is necessary to use X-ray inspection to detect solder defects. Particularly in the case of commercial/industrial-use products such as automotive components or server-use computers that require especially high levels of reliability and guarantee against malfunction, it is not sufficient to simply replace parts after a failure occurs. What's more, these components are produced in large numbers. Therefore, the use of underside electrode type components creates the need to include an X-ray inspection system on the production line to conduct complete inspections of all aspects of printed circuit boards (PCB) in-line to detect possible solder defects. Furthermore, the need for numerous bypass condensers directly below BGA/CSP components (on the back side of the PCB) to prevent noise causes overlapping of the images of the BGA/CSP components and back-mounted components, thus making 3D X-ray inspection necessary, rather than 2D X-ray. However, putting a 3D X-ray inspection system in the production line can easily create a bottleneck in terms of cycle time, while also increasing running cost considerably. This need for a double investment in an optical inspection system and a 3D X-ray inspection system has proved to be a problem for manufacturers. The new YSi-X is designed to solve this problem in conventional X-ray inspection by creating one hybrid machine capable of performing 3D X-ray inspection as well as 2D X-ray inspection and optics and infrared functions for optical inspection and laser-enabled distance measurement for height inspection. Development of this machine has been made possible by newly developed Yamaha-exclusive X-ray laminography imaging technology capable of separating and selecting the inspection target cross-sections, while also achieving the highest level of 3D X-ray inspection speed in the industry at 3.3 sec./FOV and lengthening the service life of the X-ray source and X-ray tubes. Yamaha-exclusive X-ray digital laminography imaging technology helps achieve 3D X-ray inspection at a cycle speed of 3.3 sec./FOV, the highest level in the industry (under optimum conditions defined by Yamaha). ●Standard equipment 3D inspection algorithms for identifying defects such as insufficient solder joint, un-melted, openings, bridging, XY shifting, θ rotation, insufficient ball size, missing ball, and voids in ball. ●Full-fledged hybrid functions capable of performing 3D X-ray inspection as well as 2D X-ray inspection, optical inspection through optics and infrared functions and height inspection with laser-enabled distance measurement. ●The ability to choose between the five types of inspection functions for the optimum method for each type of component or area enables exceptionally higher levels of inspection accuracy and performance. ●Laser-enabled distance measurement makes it possible to measure the height of inserted components and mounted component lift, as well as measuring for board warping. ●The X-ray source employs the pulse irradiation method that only generates X-rays when an inspection image is being generated and the X-ray detector uses a direct conversion method that directly converts the X-rays into electric signals during image exposure. 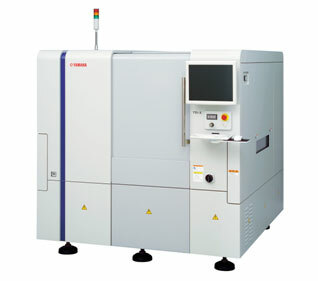 This is then coupled with newly developed Yamaha-exclusive control technology to create a system achieving a very long service life of four years for the X-ray source and the X-ray detector (under conditions of a resolution of 27µm, a cycle time of 30 sec., a running ratio of 70% and a year defined as 250 days of use 24 hours a day). This increased life also greatly reduces running cost. ●Because this is a hybrid inspection system, the single machine can perform both external optical inspection and X-ray inspection and thus reduce the user's equipment investment. ●The Yamaha-exclusive X-ray digital laminography imaging technology enables 3D imaging with fewer image exposures, thus reducing the amount of radiation exposure the product receives. ●Because it is a hybrid inspection system, X-ray inspection can be limited only to the places most suited for inspection, thus further reducing product radiation exposure. ●The amount of radiation the product is exposed to in one 3D X-ray scan is less than 1R. This low level of exposure is equivalent to that of the natural environmental radiation exposure the product would receive with six months of storage. *Depending on region, natural radiation ranges between 17 to 1100µR/h. In this case natural radiation is defined as 200µR/h. At less than 0.2uSv/h this model has a X-ray leakage rate only 1/3 the maximum permitted by law, which makes it the lowest level in the industry. Besides normal operating conditions, the system is also designed for safety during transport, on-site moving and in the case of earthquakes, etc. This model features an operator-friendly slide-open type front door with automatic closing mechanism as standard equipment. Through this front door it is possible to hand-load PCBs that have returned from post-processing for image registration and multiple circuit boards that have been cut out/separated for inspection. Shared support through "P-Tool," the same software used for PCB data creation on Yamaha SMT (surface mount technology) lines. The P-Tool programming software used for creation/data conversion/optimization of production data for Yamaha surface mounters, solder paste printers and inspection systems enables support for the entire production line. The software automatically converts data from the surface mounter into data for X-ray inspection and optical inspection, and well as assignment of inspection FOV and acquisition of sample images of non-defective products.